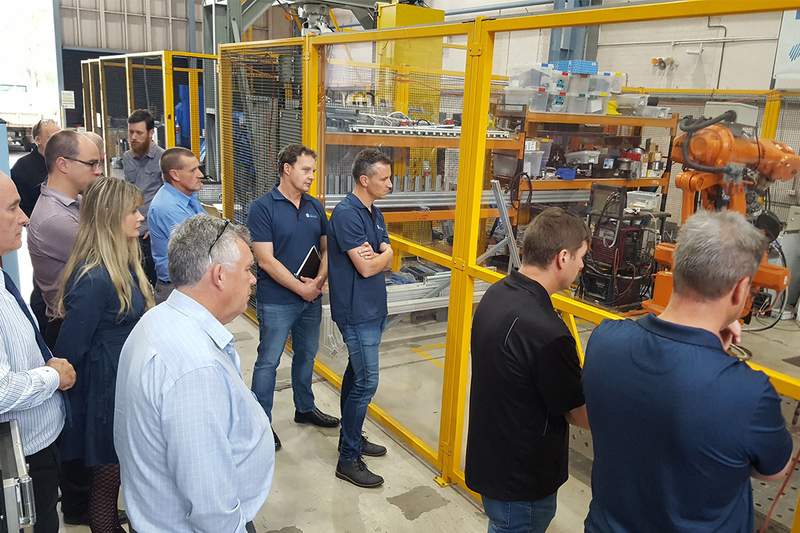 This month our CEO Troy Coyle and General Manager Welding Centre Michail Karpenko spearheaded a visit with five of our member companies to the University of Wollongong’s (UOW) Facility for Intelligent Fabrication (FIF) in Australia. This was part of our efforts to respond to member feedback which has called for greater support to take advantage of emerging innovation cluster opportunities. The trip was focused on our newly formed ‘Automation Innovation Cluster’. And while there, we also hosted a defence related session in collaboration with the New Zealand Defence Industry Association (NZDIA) to support our recently established Defence Innovation Cluster. Touring the University of Wollongong's labs. The UOW FIF is a one-stop-shop. Providing expertise, technology, equipment and training in automating steel fabrication to help manufacturing businesses adapt and compete. Their knowledge and resources drawing on decades of research-based welding and automation expertise and training. The participating companies on the trip were selected following welding productivity and automation capability assessments of their workshop conducted in collaboration with the UOW’s FIF in October. 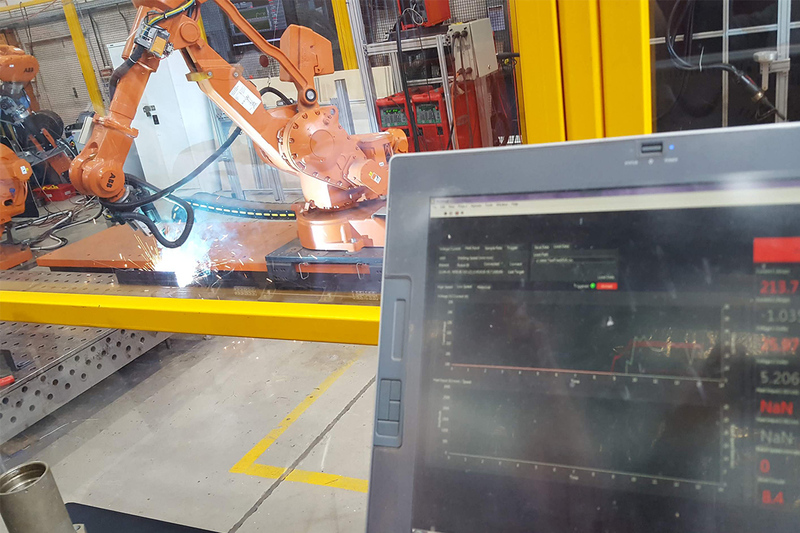 Professor’s Chris Cook and John Norrish coming to New Zealand to identify opportunities for improvement and automation during their assessments, while also offering in-depth insight into the latest developments in the field of welding automation. The day at Wollongong was full of activity. Starting with a series of presentations and case studies highlighting a selection of complex industrial automation projects successfully completed by the FIF team. 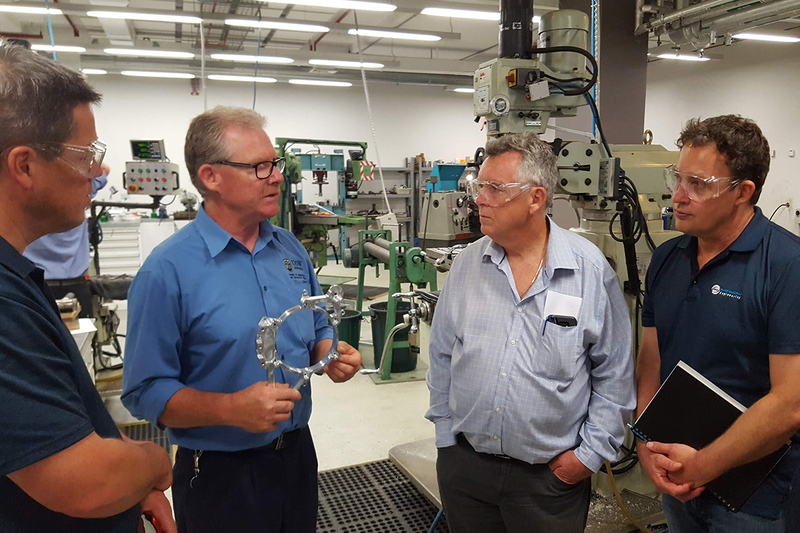 These covered a range of industries including structural steel fabrication, machinery, equipment and defence, and were presented by Professor Emeritus of Materials Welding and Joining Chris Cook, Professor Stephen van Duin, Nathan Larkin and Dr Phillip Commins. Visits to their various lab areas were also done. Showcasing the advances they’re making in several areas such as robotics, augmented reality, scanners and dust suppression technology. One of the bottlenecks associated with the use of robots in our industry is the programming time. 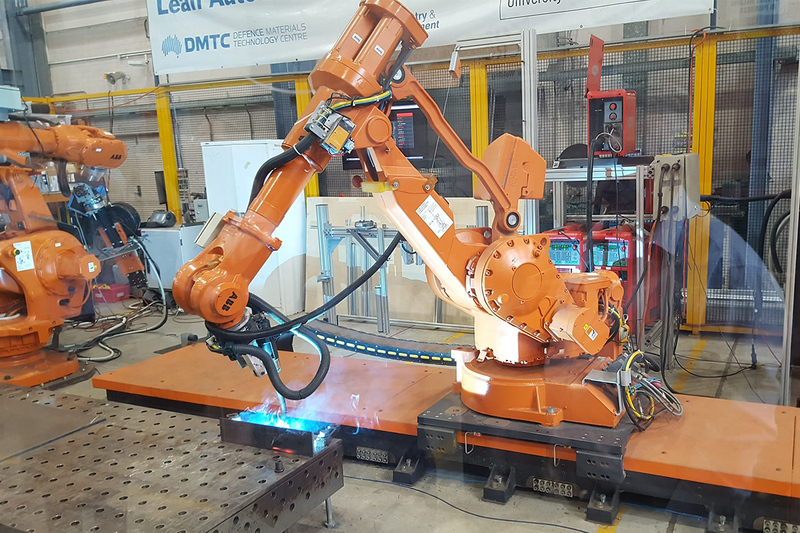 However, a trip to their robotics lab and case study demonstrations of robotic welding for complex frame structures with integrated in-process welding quality control put these thoughts to rest. Showing that the use of advanced software allows automatic recognition of intersecting surfaces, positioning of welds and collision analysis to occur within minutes. Dramatically reducing programming efforts to allow robotic systems to be used in a flexible way. Tour attendees watching a robotic demonstration. AR is an emerging technology where the perception of the user is enhanced by the seamless blending between a realistic environment and computer-generated virtual engineering objects. In FIFs AR lab, our members were given a chance to “assess” complex engineering structures in AR mode. Exploring how these systems could also be used for training and factory layout planning, by integrating it into their existing production environment. 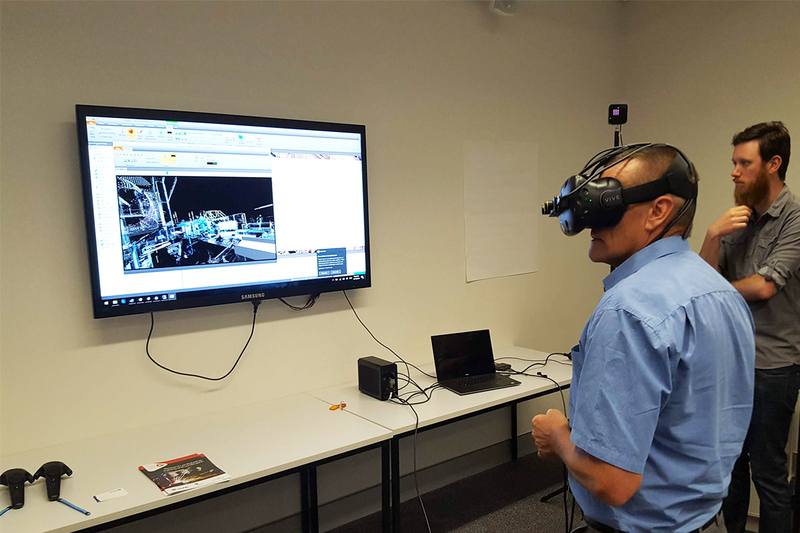 FIF using their VR systems to capture the 3D layout and environment of their clients real factories to enable them to virtually install their proposed automation solutions. The benefit being that their client can then experience firsthand how these solutions would interact with their existing equipment and processes without having to invest in its installation upfront. 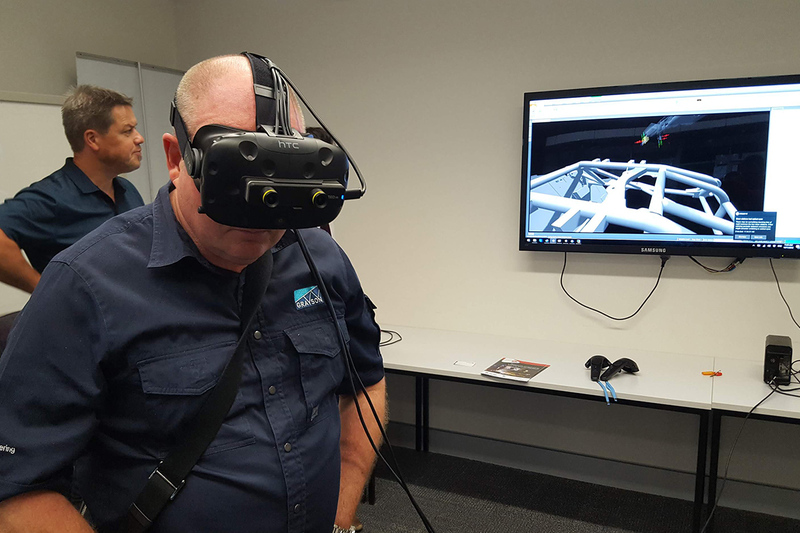 Grayson Engineering Managing Director David Moore testing out VR systems at Wollongong. Page Macrae Engineering Business Development Manager Peter Swan testing out VR equipment. Another interesting development explored was the use of high-resolution scanners. These scan and give feedback of precise actual dimensions of site works so fabricators can make accurate adjustments back at the factory. Ensuring no rework is required when delivered on site. Fugitive dust emissions are common in industry and lead to significant financial losses and negative impacts on community health. That’s why dust suppression technology is showing great potential to minimise dust emissions in the mining sector and associated infrastructure such as road, rail and port facilities for bulk materials handling. UOW’s Centre for Engineering Mechanics Director – International Solids Handling Research Institute (ISHRI) Professor Peter Wypych touched on this. Presenting a range of customised solutions to the complex problems of industrial dust control, dust explosions and risk mitigation strategies. University of Wollongong Engineering Mechanics Director - ISHRI Professor Peter Wypych presenting on dust suppression technology for bulk materials handling innovation. The day closed out with individual follow-up meetings for each of our member companies in attendance, and a discussion of future opportunities. 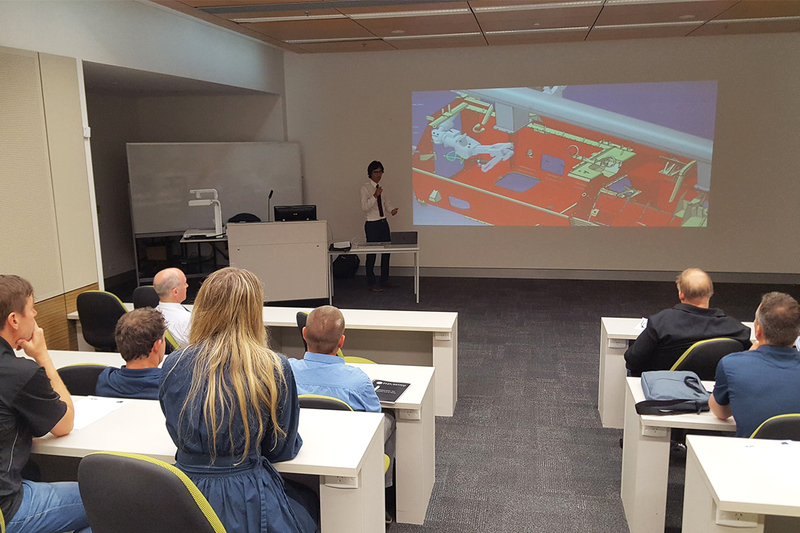 Our defence related session was organised in collaboration with NZDIA’s Defence Materials Technology Centre (DMTC) and Sydney Business School. The objective being to inform our members about the Australian Defence Project. A project considered the most ambitious defence spending program since WWII – with a massive $200 billion dollar investment in defence capability over the next decade. DMTC CEO Mark Hodge highlighted a range of opportunities for New Zealand contractors over the next decade. Clarifying that New Zealand fabricator contractors can participate in these projects as a result of the Australia–New Zealand Closer Economic Relations Trade Agreement. Michael Mclean from the Sydney Business School supported this messaging. Giving insight into the quality certification requirements and expectations for fabrication subcontractors interested in being part of these programs. In cooperation with UOW’s FIF, we’ll continue to offer welding automation and productivity assessments to our members. Helping them to identify fabricators and/or fabrication processes within their operations that can be automated. We’ll also continue to provide the option to visit the FIF labs to our first round of members who undertook automation assessments but weren’t able to join us on this trip. In terms of our research, we’ve already got a project running on data collection and analysis (a Welding 4.0 project) which will be expended. And, we’re also in further discussions with FIF to expand our capability in automation and robotics so we can collaborate further in the future. In cooperation with NZDIA and DMTC we’ll be developing a “Defense Ready” program to establish welding fabrication capabilities critical to achieving the industry base so our members can participate in the Australian Defence Project. Interested in joining our Automation or Defence Innovation cluster? We’ll use these clusters to coordinate services for like-minded members. Developing assessment programs for fabricators to comply with the requirements of multiple defence projects. As well as exclusive training and sharing of insights. Or, connecting you to international networks so you can participate in our automation assessment program and more. that 49% of large businesses of over 50 employees are committing resources this year to investigating machine control and guidance/grade control, 25% to Building Information Modelling and 21% predictive analytics. So what are you waiting for?! 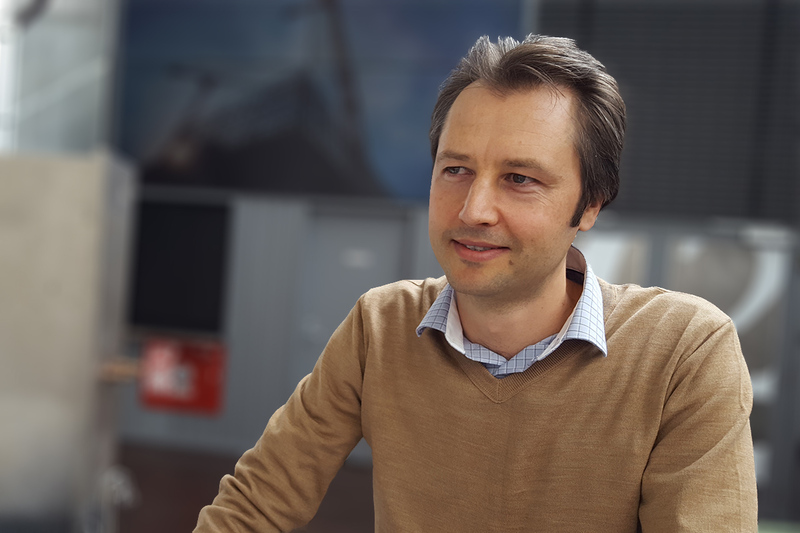 Contact our General Manager Welding Centre Michail Karpenko today!